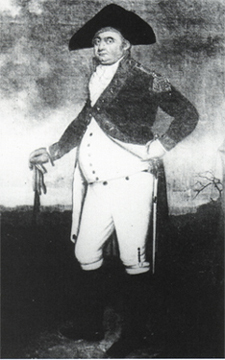 The portrait of Captain Seixas, unsigned and undated, pictures him in a patriot’s blue coat with the fringed epaulets of an officer, a white waistcoat, and white breeches. Holding his sword on his left hip, his round face and portly dimensions suggest the passage of time. The painting itself has disappeared, preserved only in the photographic plate made by Barnett A. Elzas for his 1905 publication, The Jews of South Carolina. No one expresses the contradictions of his age more clearly than Abraham Mendes Seixas. He was, on the one hand, a patriot in the American Revolution, a city magistrate, president of Charleston’s congregation Beth Elohim, and brother of America’s most prominent Jewish religious leader, Gershom Mendes Seixas. On the other hand, Seixas was a merchant who dealt in slaves and a warden of the workhouse, where criminals and runaways were punished. New York-born Abraham Seixas had come south in June 1774. Banished from Charleston for refusing to sign a loyalty oath to the British crown, he sailed to Philadelphia in May 1782.